Note: The G20 has a history of protests against capitalism and the unfair economy. As you can see from the photo above, that is already a theme at the protest this year in Buenos Aires. The Guardian reports Argentina is preparing for mass protests writing, “Friday has been declared a public holiday, flights will be diverted and public transport will be cancelled as city braces for protests.” Further, all flights over Buenos Aires will be diverted and trains, subways and all public transport will be cancelled for the duration of the summit, as the city braces for around 33 anti-G20 protests and cultural events. Anti-G20 campaigners are planning a large number of demonstrations and events. Thousands of Argentines rallied Tuesday near the site of the G20 summit to protest austerity measures being imposed by the International Monetary Fund—and backed by G20 member nations—in exchange for a $57 billion bailout of the Argentine economy. On Friday, activists protested against the forthcoming G20 summit outside the Argentinian congress in Buenos Aires. Another large protest against the G20 has been scheduled to coincide with the start of the summit, although its location has not been announced. Al Jazeera reports there will also be protests against Saudi Arabia writing: “Saudi Crown Prince Mohammed bin Salman‘s appearance at the summit is expected to cause some protests over the murder of Saudi writer Jamal Khashoggi. Western intelligence agencies including the CIA have concluded MBS ordered the murder of the dissident Khashoggi. After public pressure, prosecutors are considering a writ presented on Monday by Human Rights Watch, arguing that the Argentinian courts should invoke a universal jurisdiction statute to seek prosecution of Prince Mohammed for war crimes and torture. Deployment of some 24,000 security agents, areas closed even to pedestrian traffic, total interruption of the metro system and trains, Buenos Aires looks like an armored city and with the nerves of tip before the imminent arrival of the leaders of the G20. 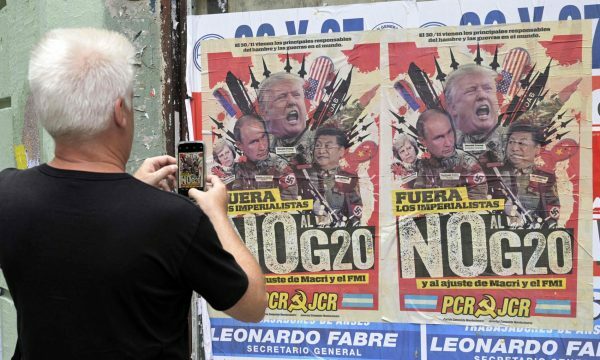 Agents and aircraft Argentina will mobilize 22,000 agents and foreign delegations will bring another 2,000 during the summit attended by these Friday and Saturday the presidents of the United States, Donald Trump, of Russia, Vladimir Putin, and China, Xi Jinping, among others , according to Security Minister Patricia Bullrich. The US delegation brings some 800 troops to Buenos Aires, but has also been authorized to enter Uruguay, on the other side of the Rio de la Plata, eight Air Force aircraft, with civil and military crew. The Argentine press speculates even with the arrival of an aircraft carrier. The authorities estimate the participation in the summit of some 15,000 people, of which 3,000 journalists. Prohibited areas In Buenos Aires, a city of 3 million inhabitants and 200 square kilometers, six zones with different degrees of security restrictions were defined. The area where the G20 will be developed, Costa Salguero, a practically uninhabited area on the banks of the Río de la Plata, will be closed to the traffic of cars and pedestrians, as well as ships and aircraft, with a zone of total exclusion of airspace. The airport Aeroparque, close to the summit, will be closed. Also that of Palomar, located on the outskirts of Buenos Aires. Only the Ezeiza international will work in the south. Also, the Port of Buenos Aires will be closed on Friday and Saturday. The other spaces of absolute restriction are located around the Teatro Colón, in the center of the city, where on Friday will be the gala dinner for dignitaries, and near the Kirchner Cultural Center, also in the historic center and where on Saturday Argentine President Mauricio Macri and Japanese Prime Minister Shinzo Abe will meet. “Made in China” equipment To guarantee the security of the summit, China made a donation of security equipment that will later be left to the Argentine police forces. The equipment consists of 30 presidential custody motorcycles, two rapid deployment trucks of riot fences and four rapid intervention armored trucks. The list also includes 87 explosives and drug detectors and 40 anti-explosive protective suits, among other materials. Holiday and demonstrations To limit the displacements of the inhabitants, Friday 30 was decreed as a non-working holiday in the Argentine capital. That same day, Argentine social movements have called for a demonstration of rejection of the meeting. “The idea that we have is that this is a peaceful, peaceful meeting, that anyone who wants to demonstrate, that has a position contrary to the G20 discussions, does so within the framework of peace, of free expression and not in the frame of violence. We are totally open to that possibility, “Security Minister Patricia Bullrich said recently.